PRESUMED GUILTY is an award-winning documentary that exposes new allegations of Swiss prosecutorial misconduct in the case connected with Belgian Jacques de Groote, 89, a former high ranking representative of the International Monetary Fund (IMF) and World Bank. The case known as “MUS affaire” involves not only Swiss prosecutors, IMF, World Bank representatives and globally recognized politicians (i.e. former U.S. President George H.W. Bush), but also global business structures like the Carlyle Group. The story involves capitalization of unique historical opportunities brought by economic transition in Central Europe after the fall of Communism in the 90s and billion dollar fines Swiss authorities imposed on Central European entrepreneurs. On February 15, Oscar Goodman, legendary Las Vegas mayor and and criminal defense attorney, will host a screening of PRESUMED GUILTY at the Mob and Law Enforcement Museum. Attending and co-hosting is political journalist and activist Chuck Muth of Citizens Outreach and Muth’s Truths. The event begins at 5pm for a very private screening hosted by Mayor Goodman. Following the event will be cocktails hosted by Mayor Goodman and Chuck Muth at Oscar’s Beef Booze & Broads–Mayor Goodman’s restaurant. Democratic Oscar Goodman united with Republican Chuck Muth in defending the big money globalist gang in Las Vegas. When he's not threatening journalists with his baseball bat Goodman may want to defend big money boys taking liberties with the law. Jacques de Groote, the former Executive Director to the IMF (1973-1994) and World Bank (1975-1991) for Belgium, was condemned in October 2013 by Swiss courts in an affair concerning the fraudulent privatisation of the principal coal mine in the Czech Republic. His co-defendants, five Czech businessmen, were given fines and prison sentences ranging from 36 to 52 months. The five Czechs were found guilty of aggravated money laundering and fraud or complicity of fraud. These verdicts punish them for the misappropriation of assets of the Czech mining company MUS (Mosteck Uhelna Spolecnost) from 1997 to 2003. Steven Norris is starting a limited partnership called Appian Equity Partners Ltd., to be based in the Netherland Antilles. It will invest the funds of a tight circle of investors -- at this point, Norris said, they include a European bank, some U.S. pension funds and a couple of wealthy Saudi families. Norris will remain as a senior adviser to Carlyle and will continue to enjoy the reportedly healthy financial return from his holdings in Carlyle business partnerships. The documentary trailer said de Groote "worked for" Appian Group, which had President George H. W. Bush and Lawrence Eagleberger on its board of advisors. It did not note that Appian halted fundraising in March 1999. The Appian Group, a firm formed by Stephen Norris-the co-founder of The Carlyle Group-has aborted fund raising for its $500 million buyout fund and will wait until it either has found an anchor sponsor or has added new partners. That speaks to a crisis in the PEU world as fundraising is the lifeblood. What happened that investors did not feel comfortable funding Appian's next move? Appian Group has come from nowhere to become one of the largest and most powerful financial groups on the Czech business scene. Since 1998 it has acquired Mostecka Uhelna (MUS), the second largest brown coal mine, and Skoda Holding, once the country's biggest engineering group. Appian is also negotiating to buy Severoceske Doly, the largest brown coal mine. Yet Appian's origins and ownership remain unclear, while its takeover methods and lobbying power have provoked controversy. Its rise and the rise of others like it in the region - such as PPF in the Czech Republic and, in Slovakia, Penta Group, J&T Group, and Istrokapital - show how secretive private financial groups have become significant players, regularly outmanoeuvring foreign investors. "These groups exist everywhere but the trouble here is that they are very influential and very closely linked to decision makers," says the head of a local brokerage. That's a critical part of the PEU model, cozying up to decision makers. Speculation over Appian's origins has focused on the group's acquisition of MUS from the government in a hostile takeover in 1998. Appian said it funded the acquisition from a US-registered parent but - according to copies of documents seen by the Financial Times - this US company later split acrimoniously, with one side claiming that it had merely licensed the use of its name to the Czech operation. The true source of the funding, the state privatisation agency alleged at the time, was that the mine's management had used its environmental reserve fund secretly to buy up floating shares and seize majority control from the state. These events could've scared away investors in early 1999. Appian says the fund has €1bn at its disposal but it has so far not revealed where this money comes from, declaring merely that it has international investors. MUS provided Appian with a stable cash flow and gave it the ear of the incoming Social Democrats, for whom the depressed north Bohemian coal basin is a stronghold. Appian quickly won a reputation as a good employer, an active charity sponsor, as well as a competent manager. When the Social Democrats privatised the almost insolvent Skoda engineering group last year, Appian was the government's favoured choice. Note the Social Democrat political connection and how it benefited Appian. Oddly a storied Wall Street firm reacted to this political pressure. J P Morgan, the government's adviser, came under heavy political pressure to grant Appian exclusivity without a tender and it eventually resigned. "We got uncomfortable with the overall situation," explains Johannes Kinsky, head of JP Morgan's Prague office. "In any case it would have been hard for us to advise the government to sell to a company that refused to reveal the source of its funds." Now that private equity is ubiquitous I wonder if J.P. Morgan would make the same decision. Appian finally snapped up Skoda for Kc800m, with the state writing off Kc3.8bn of state-held debt. That's one major public subsidy, another PEU hallmark. Yet another is paying fines for illegal or potentially illegal behavior. The five former managers of MUS received prison sentences ranging from just over a year to more than four years. The 86-year-old de Groote was the only one to escape prison and received a fine. The obvious Carlyle connection is Appian's start from a Carlyle Group co-founder. That hardly seems enough for Carlyle to allow their good name to be associated with this documentary. Might Presumed Guilty actually help Carlyle facing a $1 billion Guernsey lawsuit financed by a former Carlyle Capital Corporation investor? What if the documentary discredits the man who brought the story to Swiss investigators? 1998 The fraudulent privatisation of the MUS mine in the Czech Republic begins. 1998-1999 J. de Groote becomes the President of the Appian Group, a Swiss company based in Fribourg, specialising in investments in the companies being privatised in Central and Eastern Europe, particularly in the Czech Republic. 2000 A $500,000 dollar loan from Alain Aboudarham to Jacques de Groote turns bad, and their relationship becomes hostile. 2002 Alain Aboudarham puts pressure on Jacques de Groote and his Czech partners to get back his money, but is unsuccessful. June 2005 Alain Aboudarham is summoned before the Swiss courts to explain in detail his denunciation. Immediately afterwards, the Swiss attorney general’s office (MPC) opens an investigation. 2004 to 2006 In the United States, different courts judge the dispute between Alain Aboudarham and Jacques de Groote. Carlyle prevailed in U.S. courts regarding investor losses from Carlyle Capital Corporation (CCC). 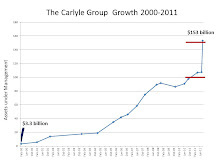 The collapse of the Carlyle fund was swift and substantial. Within just eight months of the July 2007 offering, the company had defaulted on over $16.6 billion of its indebtedness and had been forced into liquidation. A major Dutch investor lost $60 million when a Carlyle Group LP fund collapsed in March 2008. Now, he is paying for others to sue the U.S. private-equity firm, a high-stakes gamble that could make him hundreds of millions of dollars. The investor is Louis Reijtenbagh, a 70-year-old former family doctor who became one of the Netherlands’s richest men by investing in art, distressed debt and other assets. And now Reijtenbagh has invested in the bankruptcy trustee suit over permanently distressed debt. If Presumed Guilty can rescue Appian Group President Jacques de Groote by calling the lawsuit a witch hunt that could rub off on Carlyle's CCC lawsuit. Will Presumed Guilty: Part Deux tell the CCC story from Carlyle's perspective?